Shall the Board of Education of Champaign Community Unit School District Number 4, Champaign County, Illinois, build and equip a new high school building to replace the Central High School Building, build and equip an addition to and alter, repair, and equip the Centennial High School Building, improve school sites, and issue bonds of said School District to the amount of $149,000,000 for the purpose of paying the costs thereof? After talking to folks on both sides of the issue, reading what materials were available, considering the historical context, I was definitely torn on this issue, but in the end I was compelled to vote “no” on this proposition. In talking to others who also plan to vote “no” (or who already have voted), their reasons are many and varied. Some think the location is horrible, some think the price tag is too high, some just outright do not trust the school district nor the board. In talking to those that support the referendum, they are full of energy and excitement, and full of conviction to give our children “the best.” This made me chew a lot – if anything, I fall in the middle. I found it interesting that when I talked with those who generally did not feel good about the referendum, they often expressed that they felt they were being labeled as being “anti-student” or “anti-public-school”. I have also heard a rumor that teachers are being told that anyone who votes against the referendum also votes against teachers; so far, this remains unsubstantiated (I asked several teachers). Is it possible to oppose the referendum and yet still show teachers and students that you support them? I believe so. We hear a lot about a “21st Century Education”. However, the precepts of a 21st Century Education are already taking hold in our schools. The vast and ambitious plans to build hi-tech modern high schools are definitely a way for the school district to jump in with both feet in a very public fashion, but I firmly believe a 21st Century Education does not depend on a $98 million high school. I do believe new construction and new renovation would certainly help in a big way. Additionally, it is obvious that many on the board and in district administration want to open the doors of the future by ushering in new facilities. I applaud the forward-looking vision; yet I maintain that the future does not need bright shiny new buildings. I am very much disturbed by the trend of hiring consultants that do a bare minimum of community engagement, and then turn around a very expensive plan which evolves into a big ticket referendum. Looking at the historical context of referenda (past ballot issues, consent decree and enrollment), we have seen that the school district has a long-standing penchant of seeking new money for new construction as a way to address old problems. When the 1% Sales Tax was passed, the district placed a higher priority on building new schools, renovating several others and paying off previous debt than focusing on the looming problems of Central, Centennial, Dr. Howard and Edison. It is odd that the August heat at Central was not even on the list for mitigation. I wish to reiterate that there are many good reasons to vote in favor the referendum; I want to give credit to those who passionately stand behind Unit 4 no matter what. People like that are much needed. I also note that many stalwart organizations and groups are casting their support behind the referendum, including CUC2C, CFT and possibly “At Promise of Success”. Like I said, I have not arrived at my own personal decision easily, and I am still torn even now. So as not to merely vote “no” and call it a day, I suggest an alternative. In the past I have referenced a “Plan B“. That plan continues to morph and change as I learn more from those I talk with. For instance, Dr. Laura Taylor has convinced me that high school size does not matter (at least, not as much as other more weighted factors in terms of total student achievement). I have also learned that the current building that houses Judah Christian School will not be up for sale in the next two years, probably even further out. It seems to me that one of the most significant priorities of any plan going forward must revolve around what makes an awesome educational environment. I truly believe that the administration and the board believe with their heart that they are pursuing this goal, and I give them all kudos for the bold plans they have laid down, and the taking the initiative in buying a huge swath of land to get the ball rolling. Of course, I could be completely and utterly wrong. You are welcome to comment either way, but I especially value your constructive criticism and ideas for how you would improve the future. Regardless of how we vote, I do think it is very important for each of us to be involved with students, teachers and/or schools. I urge you to volunteer, whether it be over lunch, as a tutor, or just giving up an hour whenever needed, or sign up to be a mentor. The mission of the Unit 4 School District says it works “in partnership with the community”. We all need to work together to make that happen, and I am convinced that getting involved is one of the best investments you can possibly make. I recently had a good talk about Common Core with Trevor Nadrozny, the Director of Curriculum with Unit 4. I initiated the conversation by leaving a couple messages with questions about how and what data on my child is being collected. We found a time to chat on the phone, and here is what I learned. First, Common Core is a very broad, very vague set of guidelines. If I may make a gross analogy, it is like saying you have to weigh 100 pounds in 6 months. “Pounds” and “months” have standard definitions so we can all measure them the same way, but the path to get to “100 pounds” in “6 months” is totally ambiguous. Aside from the fact that everyone starts at a different place, there are different ways to get there. Maybe one person will use the path of “liposuction”, maybe another will use the “Atkins Diet”, another may use a “ketogenic diet”. Maybe one person will take the journey of “working out for 3 hours a day”. Common Core doesn’t really care how you get there, as long as you get there. The hidden problem with this approach is that it makes it hard to reward those that tried really hard and just didn’t meet the goal – maybe they lost 29 pounds, but just couldn’t get the last one off. For the record, I am not a big fan of the Body Mass Index (BMI) – maybe this is what taints my own view of Common Core – everyone is different, so we cannot all possibly fit into the same pigeon hole. But Common Core, like BMI, allows us to all talk with the same measurements, and there is some utility in that alone. Trevor mentioned that he did not have enough budget dollars to pilot these programs at every grade level, so I am not certain exactly which grades at the aforementioned schools are actually going through this exercise. In an earlier thread, Karen talked about the critical need for grammar. When I mentioned this to Trevor, he said grammar is actually actively taught right now. He used a Kindergarten class teaching Wonders as an example, where students were learning about nouns and pronouns. So obviously, it seems that grammar is indeed being taught at least in one situation – I am not familiar enough with each of the three pilots to know what importance or priority grammar takes, but a brief glance through the vendor pages (links above) indicate that each pilot program at least touches on grammar. Trevor also explain to me how there are different levels of collecting metrics. On the one hand, the district uses generic literacy screeners by way of aimsweb. Trevor compared this to taking your pulse and blood pressure when you visit the doctor’s office – it doesn’t really tell you about any root issues, but it is a way of tracking general health. He also told me about “DRA”, which has been used in previous years; I didn’t catch what the acronym meant, but it was something about “diagnostic assessments”. Doing a search on the Unit 4 website, I see that DRAs have been talked about several times in board meetings – other than that, I am not finding much information (will keep looking & asking, and will update here when I find more). Trevor compares DRAs to being like a comprehensive blood test – much more thorough than aimsweb. Apparently, DRAs are used on an “as needed” basis. Additionally, I learned that Wonders has assessments built in. It is foremost a reading curriculum aligned to Common Core, but assessments are kind of like a “bonus feature”. I did not ask, but I would assume that Journeys and Reading Street also have built in assessments. A relatively new thing is something called “progress monitoring”, which is essentially a screener (taking pulse and blood pressure) on a weekly basis. I did not ask how this was implement or for how many students. More to follow. My goal is to learn more about Common Core and what it means for our school district. I am hunting for facts. *grin* Call me narrow-minded, but I am focusing on facts that are relevant to Unit 4 and the Champaign community – broad, overarching details about the pros and cons of Common Core are less interesting to me at the moment. To me, there is still a big issue revolving around how to prepare and move students from grade to grade. I have learned, via Voices for Illinois Children’s “Great at 8” initiative, the most critical years for building an educational scaffolding from which to hang the rest of ones educational progress occurs before a child reaches 8 years of age. The Champaign Federation of Teachers (aka, teacher’s union) recently promoted a video highlighting the “Word Gap” between the rich and the poor, and how some privileged kids have a 30 million word advantage over unprivileged kids by the time they enter kindergarten. That bothers me. I think our schools have a huge challenge to tackle that gap – I don’t know how we are going to do it. As mentioned earlier, I have been on a quest to find the facts behind salaries. After waiting and waiting and not getting anywhere by waiting, I decided to FOIA the raw data and analyze it myself. Getting the data into an electronic spreadsheet was extremely time-consuming, and thus I am proud to present my work here and let anyone view the spreadsheet for themselves. The first “worksheet” is an index pointing to and explaining the other worksheets. It is not my intention to cast either the CFT or the Administration/BOE in a particular light. Rather, this is my academic work on finding facts and figures. I also wish to make it quite clear that I am a strong supporter of the teachers; I would be remiss if this post were used to disparage teachers in any way. There is a bit of consternation on both sides of the fence related to terms like “raises” and “incentives”. I am studiously attempting to avoid those terms and refer simply to “increases”, the observation of how a salary changes. As I read through the teacher contracts of the past 10 years, it was clear to me that a salary has many components and that the salary schedule is a rather complex matrix of longevity increases and increases due to continuing education. I cannot hope to explain or understand why there are some years with very strange patterns as demonstrated via the “heatmap” worksheet; for instance, in 2009 a massive increase was given to 6th year teachers in the BA track. 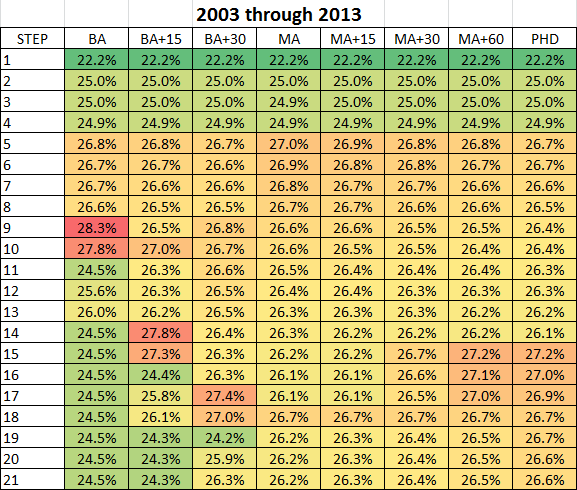 In 2012, sizable increases were doled out to two steps in the MA+30 track and the MA+60 track, each. 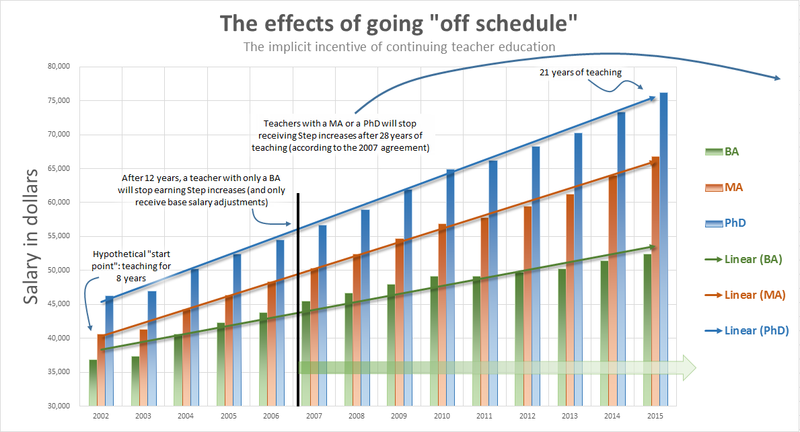 It is also interesting to visualize how the salary schedule “freezes” at a certain point for those in the BA track; some teachers in 2011 received no salary change whatsoever, if they were in the BA track. I do confess, Craig Walker challenged me to take a closer look at salaries which spurred me further to dig up the numbers. 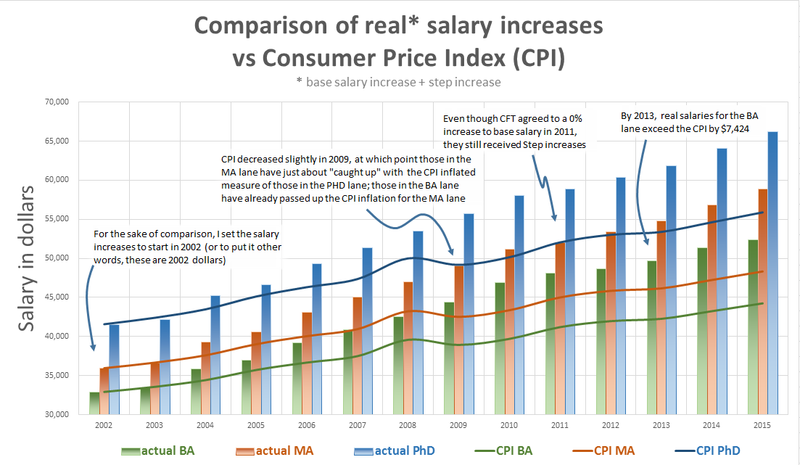 He suggested I take down a previous chart that showed teacher salary increases lagging behind the Consumer Price Index (CPI); even though I now know that the previous chart is biased and one-sided, I have decided to leave that chart “as is” because it demonstrates how hard it is to get real truth in certain circumstances. So these are my facts. I have shown you all my work, my sources and my results. Please check them as you see fit. Next time we have teacher contract negotiations, this is the kind of data I want to see. The fact that the data is archived in a printed format makes this entire exercise significantly more challenging, but not impossible. It sounds like the CESP has a ton of support from the CFT based on the CFT facebook page. Apparently the CESP reps met with the BOE and administrative reps for quite a while tonight; hopefully they have hashed out more compromises and are moving closer to a resolution. Interesting mix of agreements – looks really good for teachers, I believe. I have not yet had time to look over the summary, but am awaiting the final contract to be published. I have also requested via FOIA all contracts for the past 10 years just to do some more reading (I hear they weigh in at like 70 pages each – ouch). The Champaign Unit #4 School District Board of Education approved a contract with the Champaign Federation of Teachers (CFT) Monday. The Champaign Federation of Teachers’ (CFT) contract expired on June 30, 2013. The new contract was ratified by CFT’s membership October 16. And one step further away from a strike. I saw a link from a twitter feed about visualizing salary data, and it made me think of our teachers and Unit 4 administrators; the BART employees were seriously considering a strike, and at the last moment decided not to – not unlike our own local scenario. I am curious, what do readers think of this visualization? Is it relatively intuitive? Easy to use? Informative? Helpful? Of course, the premise is that one has access to the raw data. Unfortunately, that is a huge stumbling block in our local situation.